This beautiful 5 bed home is over 2 levels. The sparkling pool overlooks a lake with conservation beyond and is an idyllic setting for your Kissimmee stay. The bottom level has wooden flooring. Here you can relax on the bold striped sofa and watch the flat screen TV. There is also a separate sitting area if you want some peace and quiet. The home has 6 seats at the formal dining table and 4 more in the home’s breakfast nook. There is a fully equipped kitchen and washer dryer. This level also has two of the homes bedrooms. One is a queen and the other is a twin room with bright red comforters. They share the Jack and Jill bathroom and there is also a half bath on this floor. The garage has been converted to a Games Room. Here the children can enjoy pool, foosball and air hockey. Upstairs there is a King Master with his and her wash basins and a tub. The bedroom also has a balcony which overlooks the lake. There is also a den with computer should someone need to do a little work while they are on vacation. There are also 2 more bedrooms sharing a bathroom. One has a queen sized bed and the other is a themed bedroom. Here your princess can sleep with the Disney princesses. This is a super home for a family stay. Book it today! Ceanliness and warmth of a "home" welcomed us. The descriptions of the place were accurate. It has everything we needed. It made our vacation more enjoyable. eanliness and warmth of a "home" welcomed us. The descriptions of the place were accurate. It has everything we needed. It made our vacation more enjoyable. The house was so amazing once we arrived we didn't want to leave. Stewart was very professional about everything. I had questions up until the day we arrived and he got back to me within the hour everytime! My family and I were very comfortable and we plan to stay here in the future! Stewart, I just want to say thank you for having us. Everything in your home was nothing less than perfect and my family had a blast! We will be using you again next year! Great vacation rental! Value, accommodations, and location were all great! We shall return! Annette! Where do I start? The location, price, and accommodations were all we expected. Thanks again! Great vacation rental. Fantastic Five Bed Had a fantastic holiday with my family... crammed so much in with only a weeks stay at this lovely villa which had everything you could need. Had an issue with one of the door locks but Stewart very quickly had this fixed. Would definitely recommend not only the villa but Stewart too. We traveled to Orlando to celebrate my daughters 5th birthday and I am glad we chose this great property for our family. 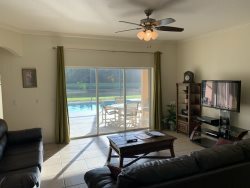 The house is very spacious, plenty of room, and the patio with the pool is awesome. When we checked in Annette left a nice Birthday card and gift for my daughter which she enjoyed while she played outside. That was a very nice touch. We were able to get back from a full day at the parks and relax in the pool. Annette is very quick to respond with any questions you have. The check in and check out is nice and easy. I look forward to coming back with my family on our next Orlando trip.